A look at cash flow analysis and correlation analysis will make the current state of Japan's modern economy clear. Private sector companies, which had their main business profits held down due to the high yen economic recession triggered by the Plaza Accord in 1985, tried to find a way out by utilizing money management techniques. Then, the sharp rise in asset values due to the use of money management techniques brought about inheritance tax measures. But the opportunity for money tightening was missed from the beginning with Black Monday in 1987. For this reason, the ability to put the brakes on the increase in asset values was lost. That was a harbinger of the bubble economy. Due to the increase in their asset values, companies would amass large unrealized gains. This created an “overloan” situation for companies. And that was the beginning of the bubble economy phenomenon. Many companies that had excessive loans when the economic bubble burst are not capable of receiving new financing. For that reason borrowers have disappeared from the market. And the general government has emerged as a borrower in the place of the private sector companies. And also, even with plans to supply funds to the market with fiscal relaxation measures, financial institutions would continue to be reluctant to finance private sector companies that were without collateral. Therefore, no matter how much they were wooed and beckoned, funds did not flow into the market. 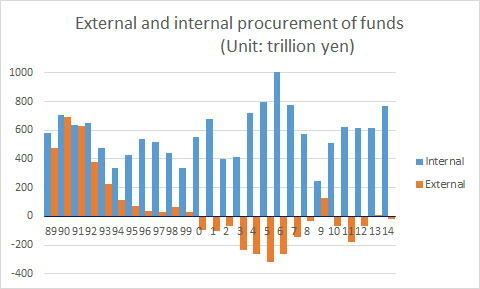 Corporate financing shifted from external procurement to internal procurement in 2000. In addition, at the same time as deregulation progresses, the profitability of companies declines and the market moves to a state of shrinking and equilibrium. The economy stops growing as the market moves toward equilibrium by a shrinking process and funds no longer flow into the actual market. And even furthermore, the bottom of the market would be broken through by the strong crush of bad debts. It can be said that, just as land started to recover, the recovery was squelched by the crisis caused by the collapse of Lehman Brothers. Even though the situation might be considered a well-deserved consequence of their actions, the performance of financial institutions degrades rapidly as borrowers go away and interest rates decline. But borrowers do not come back even when interest rates are reduced. This is due to the fact that the value of borrowers' collateral has declined as their asset values declined, and also because financial institutions have turned extremely conservative. The deposits of small and medium size financial institutions have declined rapidly, and as of 2017, small and medium enterprises account for 50% of financial institutions. This sort of a situation is caused by the decline in asset values, not because the private sector companies and financial institutions were managed badly. Declines in asset value cause excessive investment, excessive debt and excessive employment. Do not be deluded by this point. The state of the economy must be evaluated from two aspects: the resulting economic conditions and the factors that brought about those conditions. Considering only the resulting conditions causes us to misjudge the essential points, which makes it impossible to take appropriate measures. Taking your own human condition as an example: when your physical strength is weakened because of an illness, if you must do more things that further deplete your physical strength, your illness will only worsen without getting better. In addition, in response to the absence of borrowers in the market, the government becomes a borrower, and at the same time as a deterioration to a fiscal deficit comes about, large amounts of money are supplied to the financial market. Private sector companies convert their deficits to surpluses. Funds stagnate in the financial markets and cause inflation. In order to solve the problem of inflation, the Bank of Japan is forced to purchase a large amount of government bonds. In order to get funds to circulate in the market, the Bank of Japan lowered interest rates, going to a state of zero interest rates and negative interest rates. Even so, funds did not flow, and quantitative easing measures were attempted. Nevertheless, funds were not supplied to the market. And that is the present situation. The measures to be taken are also clear. Increase the liquidity of land and increase the values of assets. Restrict certain regulations to suppress competition and improve the profitability of companies. Adjust interest rates and taxes to control the economy. Restrict public investment with the aim of improving fiscal health.